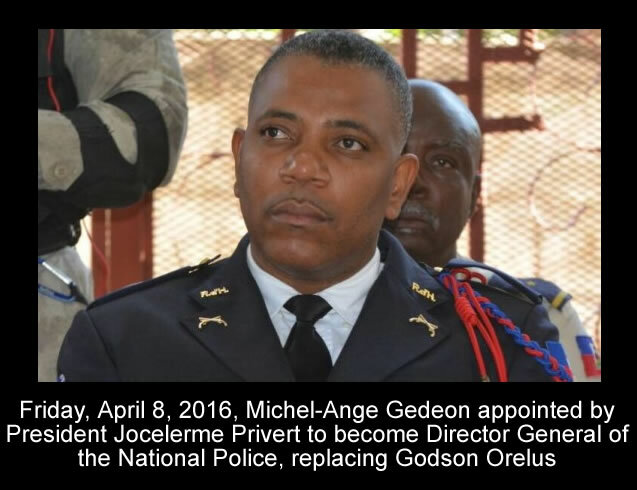 Michel Ange Gedeon has finally been nominated as Director General of the National Police of Haiti. The Senate of the Republic ratified Mr Gideon for 3 years to remain in control of the National Police of Haiti. In last February (29th), Michel-Ange Gédéon was promoted to the post of Inspector General of the National Police of Haiti (PNH) from his earlier offices, Divisional Commissioner and former head of the West Departmental Office (DDO). In last April, he was installed as the Director General of the Haitian National Police, replacing his predecessor Godson Orélus, appointed during the Martelly regime. He submitted 14 of the 16 requested documents to the Senate Justice and Public Safety Committee being led by Jean Renel Senatus (LIDE/Ouest). However, his appointment was held in an interim status, subject to a ratification by the Senate of the Republic. Finally, his installation has been legitimized by the Senate through a ratification on Thursday, August 25, 2016. During his installation while replacing Godson Orélus in last April, Gédéon had said, "Politics have hurt our institution. Under my leadership, I want a neutral police force, far from politics and professional."